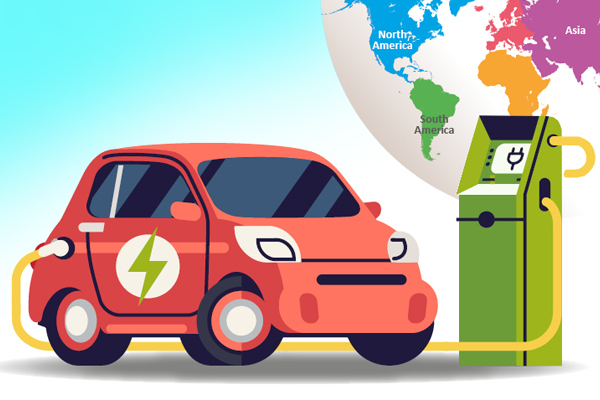 While the benefits of electric vehicles (EVs) are well known, one of the main obstacles to their mass adoption is the limitations in their charging infrastructure. In order to overcome them, some major firms are investing in better charging technologies to support a wider adoption of EVs. We’ve highlighted some of the current technological trends and developments in Electric Vehicle Charging (EVC) based on our recent research. Fast Charging: StoreDot is working towards a one-minute recharging solution for electric vehicles. Efforts are being made to reduce the drawback of available fast chargers by developing universal fast chargers, ultra-fast chargers and bidirectional fast chargers. Battery Swapping: Although battery-swapping provides a quick and efficient way for charging, existing battery-swapping facilities have failed due to their complex and expensive infrastructure, battery degradation, and incompatible batteries available at swapping stations. There’s a need for a more accessible battery design, cross platform and brand compatibility features. Wireless Charging: Wireless charging solutions, such as dynamic wireless charging, have considerable potential of reducing battery charging times. The main drawbacks currently in wireless charging are the EV-charger alignment issue and foreign object interference. However, considerable research is being carried out to overcome these drawbacks. Renewable Energy Charging: Renewable energy charging provides innovative solutions to solving EVC challenges. Self-charge EV and no-grid dependency are a few examples of these solutions. Efforts are being made to increase efficiency of renewable-energy chargers, which is indicated by the R&D in sun tracking technologies and solar-wind hybrid charging techniques. Integrated Solutions: ABB and Tesla, the forerunners in the fast chargers domain, have realized the potential of renewable energy chargers, which is indicated by their collaborations. Integration of wireless charging, fast charging and renewable-energy charging show benefits in V2V, V2G, V2I, V2H and charging on-the-go applications, and show potential to overcome many EVC-related challenges. As new technology developments gain momentum, there’s increasing pressure on business managers to identify trends that can potentially change their business scene. Adapting your business accordingly, requires in-depth market intelligence and planning. Speak to us to learn how Netscribes can help.